Creative Learning Update - over the next few months we are offering schools, community groups and families an exciting programme of Creative Learning activities, tours and events related to our temporary exhibitions and the Big Draw month. Download a copy of our latest Creative Learning programme to find out what’s on. McManus Active! offers something for visitors of all ages and interests, through a regular public programme complementing the City's Arts & Heritage. The programme celebrates national events throughout the year such as Children's Art Day, The Big Draw, Museums & Galleries Month and Doors Open Days. Activities take place mainly at weekends and during school holidays. Creative Connections is our lively and diverse programme of work developed in partnership with the city's local communities. Activities are tailored towards supporting informal learners and first time visitors and are devised to encourage a longer term engagement with the museum. 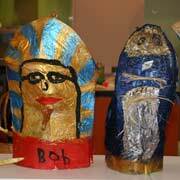 The programme includes facilitated visits to the museum, artist led workshops, projects and events. Provision may take place at The McManus or in Community venues city-wide. McManus Schools Programme offers Primary and Secondary Schools creative learning opportunities for curriculum and course enhancement. Activities include both self directed and facilitated visits, discussion sessions with curators and museum staff, resource packs, projects and artist led workshops, study support and professional practice development for teaching staff.